From our friends at live event creative agency, Experience DNA, we received a fun but unusual brief: “we want you to create a video that’s looks amateurish but is fun to watch”. Now we’re just piloting our Video4Business courses to help businesses create videos that don’t look amateurish so for a moment we thought maybe we’re wasting our time there if “amateurish” is the new vogue?! Actually, what was wanted was a video that captured the essence of the TAL Life Customer Service team and their new office space without looking too slick. It was to accompany their submission to the Customer Service Council Awards. To keep the video driving along, we felt that it needed a narrative beyond “someone walking around with a camera”. After a bit of grey-matter stretching, a few twirls of the juggling clubs to focus the mind further, we came up with the concept of shooting the whole thing from the view-point of someone trying out their new “Google Glass” gadget. This would also give us a device for pulling up supporting graphics, etc. And the best news? The TAL Life Customer Service Team won the 2013 CSC Gold Medal for Medium Enterprise. Our congratulations go out to the TAL team and we’d like to believe that our video just helped in their quest just a little bit! Every couple of years AMP holds a “must not miss” event that is actually open to the public as well as employees. It’s the Amplify Festival – basically, a week long innovation festival featuring some of the best minds from around the planet. As one participant commented “It’s like TED but for a WHOLE week!” For the 2013 Amplify, Screentime Communications looked after the technical staging of the main event as well as the multiple camera coverage of all the main sessions which were recorded for archive but also streamed out live by Viocorp. We also recorded a number of the ancillary events that took place during the week including the breakfast sessions with speaker panels that proved to be lively, entertaining gatherings. From our perspective, it was an exhausting but very rewarding project to be a part of with an unusual challenge that you get so absorbed in the content you forget you’re supposed to be working! For instance, take a look at our personal favourite presentation by Rachel Botsman on the Reputation Economy and we’re sure you’ll see what we mean. However, if you’re short on time, have a look at the highlights video we produced to see what you missed! As part of the Amplify Festival project last year, we produced this little video about the “Solstice Lamp” installation at AMP as part of the the 2013 Vivid Sydney light festival. Vivid is a festival of light, music & ideas that takes place in Sydney every winter. As Vivid partners, Amplify hosted three installations in 2013. The main installation, on the front of the AMP Circular Quay building, echoed the “Transformation” theme of that year’s Amplify Festival which featured paper cranes as part of the theme. The music and movement elements of the installation blended beautifully to create a dynamic art piece and was particularly loved by kids as they soon discovered that as they moved around the installation area hoops of light followed them and encircled them whenever they stopped. And once a big enough group was formed, the music would change and the theme’s flying paper cranes would appear on the outside of the building and fly off up the building. For us, it was fun to shoot as it leant itself to time-lapse sequences and some low light challenges – a GoPro on the end of a monopod waved above the area and near the laser projection proved fruitful too! Finance expert, Julia Bickerstaff, runs a website called “The Business Bakery”. This is a lovely site filled with tips to help (mainly female) micro-businesses achieve a healthy profit. Julia also runs a “Healthy Income” coaching program. For her site, she wanted to add a series of video tips as well as introductory videos to both the main site and the “Kitchen” workshops. And this is a great example of how video can be a great way to generate a lot of content quickly. Content that search engines love, content that increases open rates in newsletters and content that engages our audience and builds your brand and awareness. So, in one day, on location at Julia’s home, we recorded thirty two minute video tips and the two introductory videos. We then produced a fun little title sequence incorporating the icons from her site and delivered to Julia a package of videos that she could trickle out over the subsequent thirty weeks. The Entrepreneurs’ Organisation is a vibrant global group of entrepreneurs who support each other to help improve and grow their businesses. We produced this video for EO to help explain to both the media and prospective members what it meant to be part of EO. The video featured a series of interviews with Australian members who explain the criteria for membership, how EO works and what they’ve gained by being members. We shot the interviews using two cameras and applied a black and white treatment to the closeup “moving” angle to give the overall video more dynamism than would have been possible with one static angle on each interviewee. Just a quick thank you for all the effort you put into organising and producing the promotional video for the media event. This video was a great way to present EO to the media and is a great tool for us to use in future. We couldn’t have done it without you. Thanks again. Michelle Gamble, EO Sydney Communications Chair. 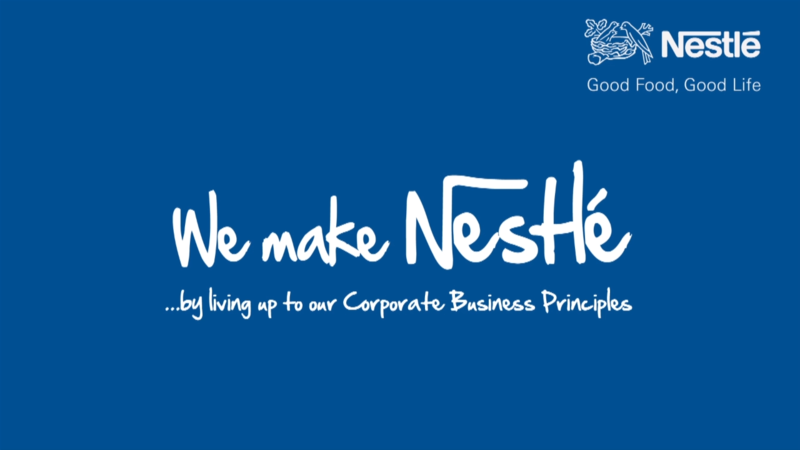 In late 2013, in addition to the “We Make Nestlé” video, we produced a second video that was shown at the CEO briefings to staff in the Oceania region. 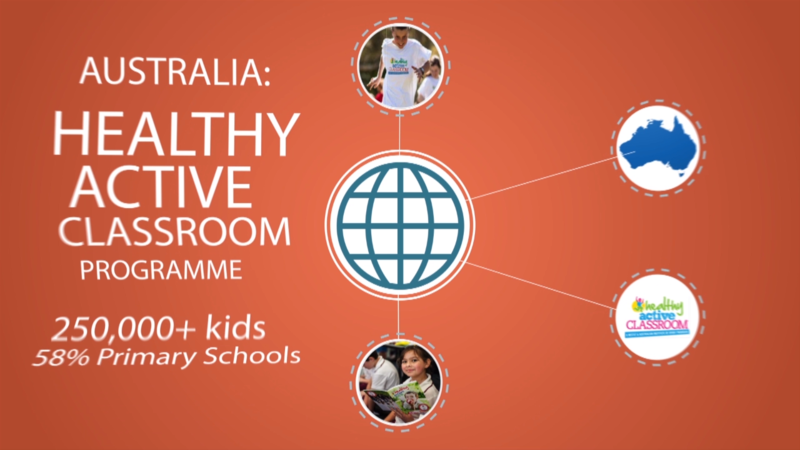 This video was an update on the achievements of the various nutrition and wellness programs that Nestlé runs in the region for children. The video consisted primarily of a piece to camera by the program’s internal champion. To make a video more engaging to watch, and where appropriate, we always try and add in as much “overlay” as possible to illustrate a topic. The challenge here was that they could only provide a handful of still shots to illustrate the program. So, to enliven it further, we produced a number of fun animating text graphical sequences in After Effects and a music bed which really helped to drive the resulting video along. In November 2013, EO (Entrepreneurs’ Organisation) South Pacific Region held an event for global members in Sydney featuring guest speakers Tim Ferriss (author of 4 Hour Week, 4 Hour Body, etc), Paul Cave (Bridge Climb founder), and a number of other motivating business speakers. A year out, to promote the event, we produced a video to launch the event that focused primarily on Sydney as a great destination as, at that point, speakers were still be negotiated. Subsequently, once a few key speakers had been confirmed, we updated the video to focus more on promoting the event content. And the promotion obviously helped as the event was sold out four months before it took place. For our friends at creative event agency Experience DNA, we produced the AFA Adviser of the Year Award video in both 2014 and 2013. Sponsored by Zurich, the video features the winner talking about what it means to them to win this coveted award whilst they spend the day touring the Zurich Australia head-office. For us, we treat start the shoot with an interview with the winner and then use “fly-on-the-wall” coverage of their Zurich tour as overlay to enhance the video. The objective of the video is to encourage other AFA advisers to participate in this year’s award process. 2012 marked the tenth year of the Association of Financial Advisors (AFA) Adviser of the Year Awards, sponsored by Zurich. To celebrate this milestone, we were commissioned by our friends at live event creative agency ExperienceDNA to travel around the country and interview the previous winners to find out how they became involved in the industry, what winning the award meant to them and how it affected their business. Basically, we asked the question what does it take to achieve “Greatness” in the financial services industry? As this was fundamentally a “talking-head” video, we decided to shoot it using two cameras – the main camera providing the traditional interview angle and the second camera adding dynamism to the piece by providing alternative tight shots and small moves, focus pulls, etc. The final video was shown during the tenth award ceremony and was very well received. We then created an updated version for 2013 that included the 2013 AFA Advisor of the Year winner, Olivia Maragna.